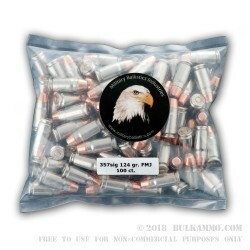 1000 rounds of .357 Sig ammunition that is packaged in simple clear plastic bags with a giant eagle’s head on the bag. 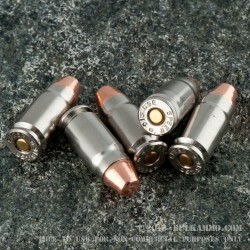 The case lot includes 10 - 100 round packages. The giant eagles’ head represents MBI, Military Ballistics Industries, a company that prides itself on being able to offer high quality remanufactured ammunition to the civilian market, that is utilizing once fired brass. 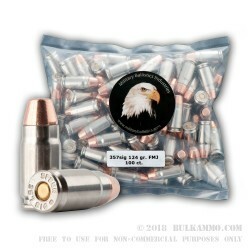 The benefit of buying remanufactured ammunition (if you are already considering doing this) from MBI is that they forego the creation of expensive cardboard boxes and packing trays in favor of using cheap plastic bags that can be heat sealed on a cheap heat sealing machine. 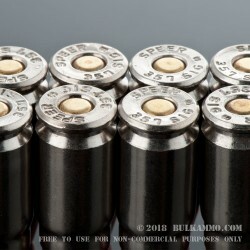 They do this in order to provide you with a lower cost, without having to sacrifice the component parts they load their once fired brass with. 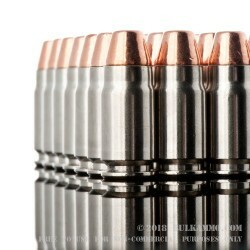 MBI uses high grade components from Winchester, Federal, Hodgdon, CCI and others. 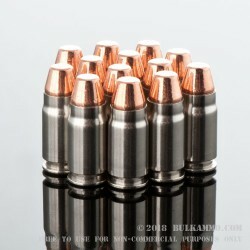 That makes them unique in the world of remanufactured loads and makes this purchase appealing, especially considering how good the price point is.